Atlanna (Nicole Kidman), the queen of the underwater kingdom of Atlantis, washes up on the shores of Amnesty Bay, Massachusetts. She's rescued by lighthouse keeper Tom Curry (Temuera Morrison) and they fall in love. They have a son and live a happy and uneventful life, until Atlantis soldiers attack the lighthouse when they're ordered to bring Atlanna back home. To keep her family safe, Atlanna complies. 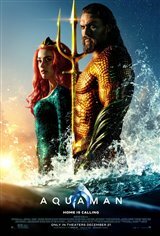 Years later, Arthur (Jason Momoa) discovers he's the heir to the Atlantis throne and is to be crowned King of the Seven Seas. However, his younger half-brother Orm (Patrick Wilson) wants the crown for himself.